Staff Sergeants Charmaine and Jean Fortune met at the Robins Air Force Base in Georgia, got married and pursued a shared dream of becoming nurses. Air Force Sgt. Alan Brailsford struggled with substance abuse for years and plans to help others on the path to recovery, as a social worker. In addition to answering the call to serve their country, all three share a commitment to changing lives and are receiving their degrees from FIU this summer. 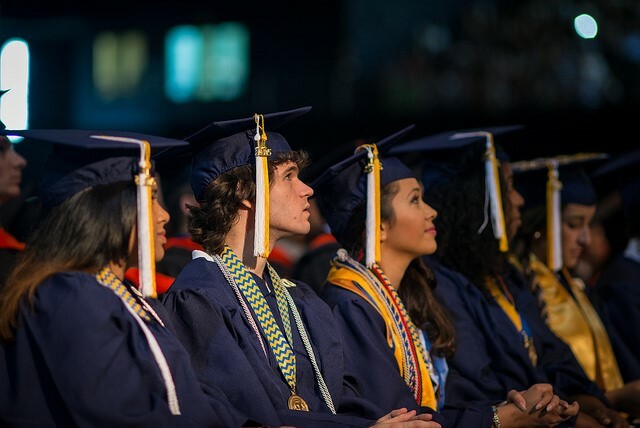 They are among almost 3,800 FIU students who will graduate during seven ceremonies Aug. 7, 8, 9 at the FIU Arena, 11200 SW 8th Street in West Miami-Dade County. As a teenager in the Philippines, Charmaine Fortune cared for her terminally ill grandmother. This experience inspired her to pursue a career in nursing, so she enlisted in the U.S. Air Force to pursue a health care career. While juggling a full-time job as a military medic, she also was a full-time pre-nursing student. Excelling in her studies, she received a full scholarship to FIU’s Medic to Nurse program, which helps veterans and active duty personnel with military medical training pursue a bachelor’s degree in nursing. Fortune, 26, and her husband will both be stationed at Fort Sam Houston Joint Base as 2nd Lt. Air Force nurses. The Fortunes will graduate with bachelor’s degrees in nursing Monday, Aug. 8, 2016, at 10 a.m.
After high school, Alan Brailsford enlisted in the Air Force. He served as a medic in the intensive care units and emergency rooms of surgical wards and clinics. After leaving military service, he decided to come out as a gay man. His parents were compassionate and understanding, but society was not as accepting – and he turned to alcohol and drugs. With the support of his parents and brother, and through a 12-step program and volunteering, he was able to overcome his disease. Brailsford, 55, has been sober for eight years and plans to spend the rest of his career in social work helping others cope with addiction. He will graduate with his master’s in social work Monday, Aug. 8, 2016, at 3 p.m. This semester’s graduates also include the first classes of two new graduate programs, in emergency management and psychology. The two inaugural classes are from the master’s program of the Academy for International Disaster Preparedness and the Clinical Science Doctoral Program in Child and Adolescent Psychology. Orestes Mirabal, 39, grew up in a household where domestic abuse, violence and illegal activities were all too common. After dropping out of high school, Mirabal joined a gang. His determination to lead a meaningful life, and a combination of mentoring and education, changed the course of his life. Mirabel earned his GED, got married, and has worked at UPS for over 15 years. He has established a non-profit mentoring organization designed to help low-income Miami-Dade youths get into college. Mirabal will receive his master’s in business administration Tuesday, Aug. 9, 2016, at 3 p.m.
Somaye Fakharian, 32, worked for three years at the Department of Transportation in Iran before making the difficult decision to leave her home and family in Tehran to come to FIU. She is the recipient of several awards, including the David Eisenhower Fellowship from the U.S. Department of Transportation. Fakharian received five job offers and has just accepted a position with a transportation company in Texas. She will receive her Ph.D. in civil engineering Monday, Aug. 8, 2016, at 10 a.m.
Vivian Dimond ’80, a South Florida real estate professional, will receive the FIU Medallion for Community Service at 2 p.m. Sunday, Aug. 7. Annie R. Neasman ’76, president and chief executive officer of the Jessie Trice Community Health Center, will receive the FIU Medallion for Community Service at 10 a.m. Monday, Aug. 8. Marie Izquierdo, a two-time FIU alumna and chief academic officer for Miami-Dade County Public Schools, at 7:30 p.m. Monday, Aug. 8. Miguel “Mike” B. Fernandez, chairman of MBF Healthcare Partners, a Coral Gables-based firm that invests in the health care industry, at 10 a.m. Tuesday, Aug. 9. For a full commencement schedule, please click here.